We have now reached the end of the initial testing phase of our controller build. The work that Stas has done on it will be integrated into the anims build at a later date (though we can't say for sure which version that will be in), and any other relevant/demanded tweaks will be added at this point. The Controller beta is staying open - but won't have active work done on it until our animation system is closer to completion. This is due to the fact that Stas is moving onto pastures new, and in terms of the rest of the team we're currently all hands to the pump getting the core components of the next version of PZ in place. Tell us the three tweaks/fixes to the current Controller set-up that would most improve your experience. We would also like to thank @Stas from general arcade for all his hard work on this aspect of the game! I wanted to play splitscreen, i was on the controller beta. I tried several times but after i created my character my spawn next to player 1, i could move around but it was impossible to open the inventory (pressing Y was doing nothing, even if, in the game menu I could see that the controller was recognized and the Y button was pressed). So we change to the normal 40,3 and after a little bit of messing around, we manage to start a new game and everything was fine. For now, to create a splitscreen game, you have to connect your controller, start the game, start a new game with the K/M, and once in the game press A on the controller and create your character. 1/ Say that you are alone, playing with a controller, and your gf just comes in. Give her the possibility to create a new character and make a splitscreen game by just pressing a keyboard button. If there is already a button, then makes it more obvious so that the process of creating a splitscreen is less tedious. 3/ Give me the ability to enlarge or reduce the windows of the inventory of the player with a controller. It was kinda overwhelming and too big sometimes. Hello. The window showing the materials needed to build or repair something in the context menu (like the carpentry menu) are still missing. That could be one. Two would be the customizability of the face buttons and the addition of more actions to assign to them. 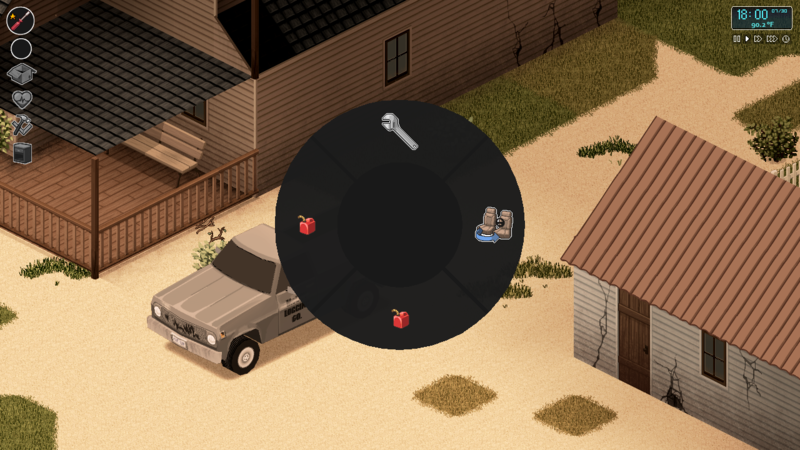 Three would be the re-integration of the quick-move button, but have it function only to transfer items between inventories instead of throwing your items on the ground. Last week, RobertJohnson said this "fixed: Remove "Vehicle Sub Menu" from Car tab (unless there is the need for this - I do not know what this does)"
but it had a function. 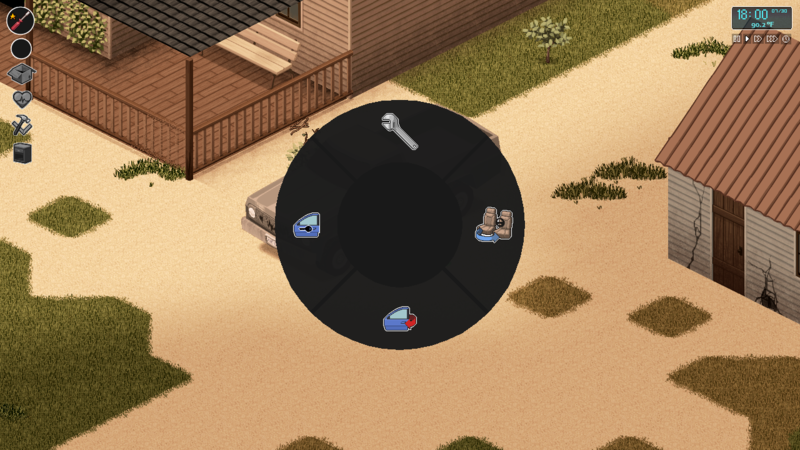 When holding up on the D-pad, it brings up a radial menu with a list of actions you can do to the car without using X to bring up the context menu. I will post pictures. I think this should be re-integrated. IIrc, It was a duplicate of an existing function. The radial menus are so nice though i can see it though. For anyone who sees this, I check this thread daily for activity, so don't be afraid to post. The issues still persist that I have posted about, as well. I'm sure any and all concerns or cries for help are appreciated . did you copypasta both the name and the password into the text bars or type them out yourself? I'll try it on another account I have. EDIT: I mean copy the password. I forgot how the beta window works until I used it. I just tested the password to verify that it works. In case you're not copying it, it's 3 "s" in a row. You only enter the password "badassstas456". How are you liking the controller test beta so far? I personally don't really like the inventory controls but i think that more options will be added to help with that in the future, plus of course the issues above that I've posted.